Mol. Cells. Jun 30, 2018; 41(6): 506-514. The transcriptional regulation of genes determines the fate of animal cell differentiation and subsequent organ development. With the recent progress in genome-wide technologies, the genomic landscapes of enhancers have been broadly explored in mammalian genomes, which led to the discovery of novel specific subsets of enhancers, termed super-enhancers. Super-enhancers are large clusters of enhancers covering the long region of regulatory DNA and are densely occupied by transcription factors, active histone marks, and co-activators. Accumulating evidence points to the critical role that super-enhancers play in cell type-specific development and differentiation, as well as in the development of various diseases. Here, I provide a comprehensive description of the optimal approach for identifying functional units of super-enhancers and their unique chromatin features in normal development and in diseases, including cancers. I also review the recent updated knowledge on novel approaches of targeting super-enhancers for the treatment of specific diseases, such as small-molecule inhibitors and potential gene therapy. This review will provide perspectives on using super-enhancers as biomarkers to develop novel disease diagnostic tools and establish new directions in clinical therapeutic strategies. During embryonic development and cellular differentiation, distinct sets of genes are selectively expressed in cells to establish specific tissues or organs. Such highly organized molecular events are tightly regulated at the transcriptional level, and this precise spatiotemporal gene regulation is essential for normal development (Herz et al., 2014; Levine, 2010; Ong and Corces, 2012). Although the promoter region of a gene—a DNA element in close proximity to the transcriptional start site (TSS)—is sufficient for the initial assembly of the transcriptional machinery for gene transcription, this step often induces only limited or basal levels of gene expression. Gene expression levels can be dramatically increased through the cooperation between a promoter and distal regulatory regions by promoter–enhancer interactions (Carter et al., 2002; Tolhuis et al., 2002). More than three decades ago, the first enhancer element was identified as a short DNA sequence in the SV40 virus genome, which could enhance expression of the β-globin gene in HeLa cells by several orders of magnitude (Banerji et al., 1981). Since then, many enhancers have been identified in both prokaryotes and eukaryotes, and their biochemical and physiological functions have been extensively studied (Banerji et al., 1983; Kulaeva et al., 2012). Several hallmarks of active enhancer regions have been identified, which can be used for the prediction of putative enhancers in the mammalian genome (Heinz et al., 2015; Shlyueva et al., 2014). Prior to the adoption of various genome-wide analysis tools, only the short enhancer elements in the local DNA region could be identified and studied. However, through the integration of chromatin immunoprecipitation and next-generation sequencing technology (ChIP-seq), whole-genomic landscapes of regulatory elements controlling specific gene sets can now be thoroughly explored. This approach led to the discovery of a new class of enhancers known as super-enhancers, which covers the extremely long region of regulatory DNA and are closely associated to cell identity genes (Hnisz et al., 2013; Whyte et al., 2013). In this review, I focus on the available tools for identifying super-enhancers, as well as their chromatin structures and compositions, and summarize the compelling evidence revealing the biological functions of super-enhancers in determining cellular identity. I further highlight the physical alteration of super-enhancers during tumorigenesis and at the onset of other complex diseases and discuss targeting of super-enhancers for treatment and as useful biomarkers for disease diagnosis. Enhancers have been extensively studied since the 1980s as distal regulatory elements controlling the expression of specific genes in cooperation with a proximal promoter (Levine et al., 2014; Ong and Corces, 2011; Shlyueva et al., 2014). There are three key characteristics used to identify an enhancer region. First, active enhancers are found in open chromatin regions devoid of nucleosomes, which allows for binding of the transcriptional machinery, including RNA polymerase, transcription factors, and co-activators. Second, active enhancer regions are typically enriched with a posttranslational modification histone mark such as monomethylation at H3 lysine 4 (H3K4me1) and acetylation at H3 lysine 27 (H3K27ac). Finally, putative enhancer regions often contain conserved DNA sequences for binding to specific transcription factors. The identification of super-enhancers shifted the focus onto the regulation of cell type-specific genes. Super-enhancers were initially identified in embryonic stem cells in 2013 (Hnisz et al., 2013; Whyte et al., 2013). In the same year, a similar concept was put forward through the identification of so-called “stretch enhancers” that harbor significant risk variants associated with type II diabetes (Parker et al., 2013). Subsequent studies revealed several cell type-specific super-enhancers in a broad spectrum of different cell types, including immune cells, chondrocytes, hair follicle cells, and mammary epithelium (Adam et al., 2015; Shin et al., 2016; Siersbaek et al., 2014; Vahedi et al., 2015). Super-enhancers show several distinct features compared to typical enhancers (Fig. 1A). Unlike typical enhancers, super-enhancers comprise a set of enhancers that span across a long range of genomic DNA (> 10 kb). Each constituent enhancer is densely occupied by lineage-specific or master transcription factors, mediators, and histone marks. Notably, these clusters of enhancers are closely associated with genes that determine the specific cell type. Several studies have also shown that enhancer RNAs (eRNAs) are associated with super-enhancer regions (Ko et al., 2017; Liang et al., 2016; Pefanis et al., 2015). eRNAs are a class of non-coding RNAs transcribed from the DNA sequence of enhancer regions and play an active role in the transcription of nearby genes, potentially by facilitating enhancer–promoter interactions (Kim et al., 2010). Super-enhancers are frequently insulated by CCCTC-binding factor-binding sites, suggesting that their activity may be limited by boundary elements (Dowen et al., 2014; Lee et al., 2017; Willi et al., 2017). Super-enhancers are typically isolated using the Rank Ordering of Super-enhancer (ROSE) algorithm by analyzing ChIP-seq binding patterns of active enhancer marks such as H3K27ac, mediator complex subunit 1 (MED1), and lineage-specific or master transcription factors (Whyte et al., 2013). MED1 is a subunit of the mediator complex that functions as a co-activator to drive RNA polymerase II-dependent transcription by promoting the looping of enhancer to transcription start sites (Kagey et al., 2010; Yin and Wang, 2014). 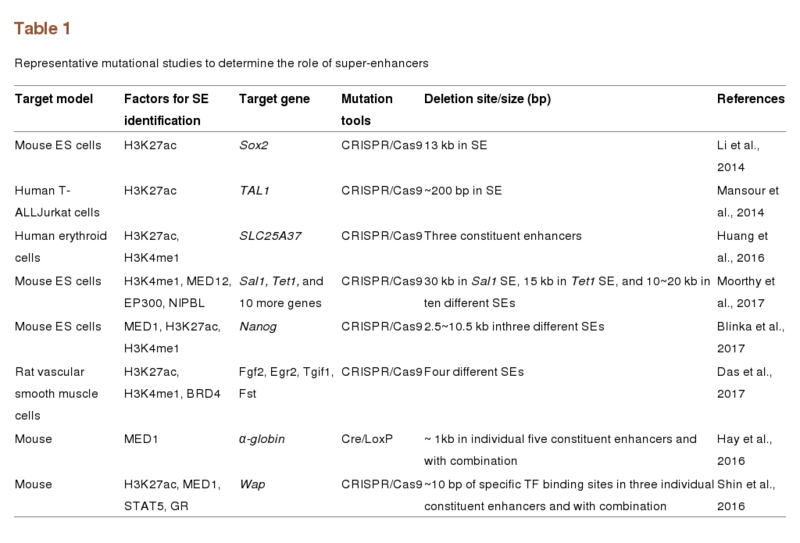 Initial studies often focused on only one or two of these factors to identify super-enhancers. However, employing a greater number of indicators simultaneously can result in a robust set of super-enhancers that are highly correlated to cell type-specific genes (Shin et al., 2016) (Fig. 1B). To further confirm the genomic features of super-enhancers, the chromatin accessibility of candidate regions can be examined by a DNase I hypersensitive assay. Subsequent super-enhancer candidates can then be annotated based on the nearest gene, and the gene expression levels can be examined using RNA-seq to determine correlations with high levels of cell type-specific genes in comparison to lone enhancers. With this approach, the complete chromatin landscape of super-enhancers can be mapped in the mammalian genome. Several studies have shown that even an ectopic fragment of a super-enhancer is capable of inducing high levels of reporter gene expression compared to a typical enhancer in vitro (Adam et al., 2015; Loven et al., 2013). Although the activity of super-enhancers was clearly demonstrated using reporter assays in vitro and super-enhancers are frequently found near genes controlling cell identity, there has been general skepticism related to their precise biological functions given the lack of compelling in vivo animal studies (Pott and Lieb, 2015). Indeed, although several recent studies have shown that deletion or mutations of super-enhancers in specific cell lines could reduce the expression levels of cell type-specific genes (Huang et al., 2016; Li et al., 2014), this phenomenon might not fully represent the in vivo function of super-enhancers in animal models (Hay et al., 2016; Shin et al., 2016) (Table 1). With progress in genome editing technology, it has now become feasible to delete or mutate specific super-enhancer regions and examine their in vivo biological functions in the mouse genome. Recently, Shin et al. (2016) identified 440 mammary-specific super-enhancers through ChIP-seq analyses in the mouse genome, and the in vivo function of one of mammary-specific super-enhancers, the Wap super-enhancer, has been interrogated using CRISPR/Cas9 genome editing technology. Wap is a major milk-producing gene in mice and regulated by a super-enhancer constituted with three individual enhancers, which exists upstream of this gene in the mouse genome. Using CRISPR/Cas9 genome editing, small deletions or mutations were generated in individual or in all three constituent enhancers of the mammary-specific Wap super-enhancer of the mouse genome. Disruption of all three constituent enhancers dramatically reduced the expression levels of mammary-specific Wap genes by ~99%, indicating that isolated super-enhancers do indeed function in the regulation of mammary-specific genes in vivo. Super-enhancers are also highly sensitive to external environmental cues such as lineage-determining or cell differentiation signals (Adam et al., 2015; Shin et al., 2016). Moreover, mutational analyses of individual and combined mutations of three constituent Wap super-enhancers revealed a hierarchy in their functions. The most distal enhancer plays a key role in regulating the expression of a mammary-specific Wap gene (Shin et al., 2016). However, individual constituent super-enhancers in erythroid cells showed independent functions without any hierarchy, indicating that the constituent enhancers function differently in different cell types or under different environments (Hay et al., 2016). Oncogenic super-enhancers were first identified in multiple myeloma cells, showing a high density of MED1 and bromodomain-containing protein 4 (BRD4) bindings (Loven et al., 2013). BRD4 is a member of the BET family proteins, which include BRD2, BRD3, BRD4, and BRDT (Zeng and Zhou, 2002). BET family proteins commonly contain two bromodomains that can recognize acetylated histones, bind to mediator complexes, and participate in the regulation of transcriptional elongation through interactions with RNA polymerase II (Hnisz et al., 2013). Several other oncogenic super-enhancers were subsequently found across a broad spectrum of cancers, including neuroblastoma, small-cell lung cancer, medulloblastoma, breast cancer, esophageal cancer, gastric cancers, and melanoma (Sengupta and George, 2017). There are two main types of aberrant super-enhancers found in various cancers: those involving mutations generated in super-enhancers and those involving the acquisition of new oncogenic super-enhancers. Single-nucleotide alterations have been frequently identified within or near super-enhancers that drive tumorigenesis (Fig. 2A). A single nucleotide polymorphism (SNP) within a super-enhancer in the first intron of LMO1 causes differential binding of the transcription factor GATA to subsequently influence neuroblastoma susceptibility (Oldridge et al., 2015). Somatic structural variants in GF1- and GF1B-coding sequences along with the nearest super-enhancer were shown to drive the oncogenic activity in a medulloblastoma mouse model (Northcott et al., 2014). In addition to these somatic mutations within super-enhancers, de novo super-enhancers are often acquired via small insertions and deletions (indel), DNA translocation, focal amplification, and transcription factor overexpression, which also result in various malignancies (Fig. 2B). In T-cell acute lymphoblastic leukemia (T cell-ALL), small indels in a non-coding intergenic region of the TAL1 oncogene introduced the binding motifs of the transcription factor MYB, resulting in the formation of a super-enhancer regulating the TAL1 gene (Mansour et al., 2014). In multiple myeloma, translocation of 3′ IgH super-enhancers are frequently detected near the MYC oncogene (Hnisz et al., 2013). Translocation of breakpoints near the MYC gene established a de novo super-enhancer, which is associated with poor prognosis in myeloma patients (Walker et al., 2014). Rearrangement of 18 kb GATA2 enhancers is commonly detected in samples of myeloid leukemia patients, and is attributed as the cause of leukemogenesis via the deregulation of two unrelated distal genes (Groschel et al., 2014). Genome-wide chromatin mapping of adenoid cystic carcinoma also revealed that the translocation of super-enhancers drives the overexpression of the oncogenic transcription factor MYB (Drier et al., 2016). Besides DNA rearrangements, focal amplification of enhancer elements frequently occurs in many cancer types. Tandem repeats of DNA segments have been found within the super-enhancer of the MYC gene in lung cancer (Hnisz et al., 2013). Distal MYC enhancers are juxtaposed to the focal amplified region in ~3% of acute myeloid leukemia cases (Shi et al., 2013). Two distinct focal amplifications of super-enhancers were found at the 3′ end of the MYC gene in lung adenocarcinoma and endometrial carcinoma cell lines, which contributed to overexpression of the Myc oncogene (Zhang et al., 2016). Overexpression of transcription factors within super-enhancers is commonly found in leukemia. In T-cell ALL, overexpression of TAL1 transcription factors has been found within a super-enhancer in the MYC locus (Hnisz et al., 2013). Patients with high ratios of active STAT5 to NF-κB or IKROS within super-enhancers also tend to show more aggressive disease phenotypes of B-cell acute lymphoblastic leukemia (B-cell ALL) (Katerndahl et al., 2017). Recent studies have also demonstrated that aberrant regulation of eRNAs transcribed from super-enhancers is often linked to cancer development (Jiao et al., 2018; Ko et al., 2017; Liang et al., 2016), suggesting the importance of eRNAs as potential targets to block oncogenesis. Collectively, this evidence suggests that improper super-enhancer formation and alteration lead to abnormal gene regulation to generate various malignancies. Super-enhancers have also been associated with the progression of non-cancerous diseases, including certain autoimmune diseases, diabetes, and neurodegenerative diseases. Similar to oncogenic super-enhancers, disease-associated SNPs are frequently enriched in super-enhancers, and the subsequent gene deregulation leads to disease development. Systemic lupus erythematosus (SLE) is an autoimmune disease in which the immune system mistakenly attacks healthy tissues in many body parts due to the loss of immunological tolerance for self-antigens and the production of excessive amounts of autoantibodies. Among the 72 SNPs linked to SLE to date, 22 are found in super-enhancer regions (Hnisz et al., 2013). Other common autoimmune diseases such as rheumatoid arthritis are also associated with highly enriched SNPs in T-cell specific super-enhancers (Vahedi et al., 2015). A genome-wide association study (GWAS) of patients with an autoimmune skin disease or vitiligo identified three SNPs only 47 bp apart in a super-enhancer region between the HLA-DRB1 and HLA-DQA1 genes (Cavalli et al., 2016). Disease-associated super-enhancers were also found in primary T cells obtained from patients with juvenile idiopathic arthritis (JIA), which is characterized by the early onset of multifactorial autoimmune disease (Peeters et al., 2015). Type 1 diabetes is caused by the T cell-mediated autoimmune destruction of insulin-producing β cells in the pancreas. Among 76 SNPs linked to type 1 diabetes, 13 occur in super-enhancers in primary T helper cells (Hnisz et al., 2013). Integrative analyses of GWAS variants in type 2 diabetes and the epigenomic profiles of the skeletal muscles of patients with type 2 diabetes revealed that the disease risk variants significantly overlapped with stretch enhancers (Parker et al., 2013). Disease-specific super-enhancers are also frequently found in several neurodegenerative diseases. Among the 27 SNPs linked to Alzheimer’s disease, 5 occur in the super-enhancers of the brain tissue (Hnisz et al., 2013). Down-regulation of neuronal genes in a mouse model of Huntington disease resulted from the selective decrease of H3K27ac marks in super-enhancers (Achour et al., 2015; Le Gras et al., 2017). High-throughput screening of small-molecule inhibitors against a specific component of super-enhancers has revealed potential drug candidates. Several potent small-molecule inhibitors are already in phase I/II clinical trials to validate their pharmacological efficacy and safety (Table 2). The most extensively studied small-molecule inhibitor against super-enhancer complexes associated with multiple diseases is an inhibitor of the BET bromodomain. In particular, BRD4 is well known to interact with MED1 as a co-activator within disease-associated super-enhancers, and several types of inhibitors targeting BRD4 are currently under clinical investigations, including iBET762, OTX015, and CPI0610. The first study to demonstrate the effect of a BET inhibitor in abrogating super-enhancers was performed in multiple myeloma cells (Loven et al., 2013). Treatment of the BET-bromodomain inhibitor JQ1 to myeloma cells led to the selective loss of BRD4 at super-enhancers and revealed the transcriptional defect of super-enhancer-associated genes such as the oncogenic MYC gene. Based on these findings, the ability of a BET inhibitor in the preferential disruption of super-enhancer functions was subsequently examined in other various diseases. RNA-sequencing of T cells obtained from the autoinflammation skin of patients with JIA revealed that the BET inhibitor JQ1 preferentially reduced the expression levels of disease-associated genes by selectively disrupting immune-related super-enhancers (Peeters et al., 2015). JQ1 could also sufficiently collapse super-enhancers through inhibition of BRD4 and deregulation of MYB transcription. These effects consequently slowed tumor growth in low-grade adenoid cystic carcinoma xenograft mice (Drier et al., 2016). Depletion of BRD4 occupancy at c-Myc super-enhancers by JQ1 also significantly reduced the expression level of the proto-oncogene c-Myc in Merkel cell carcinoma mouse models (Sengupta et al., 2015). JQ1 was also shown to suppress tumor cell growth by deregulating aldehyde dehydrogenase activity through inhibiting eRNAs within BRD4-regulated super-enhancers in ovarian cancer cells (Yokoyama et al., 2016). Another BRD4-targeting BET inhibitor, I-BET151, was also found to downregulate super-enhancer-associated genes in acute myeloid leukemia (Pelish et al., 2015). Oral administration of I-BET726 to neuroblastoma mouse xenograft models showed clear tumor growth inhibition and reduced the expression levels of Mycn and Bcl2 (Wyce et al., 2013). 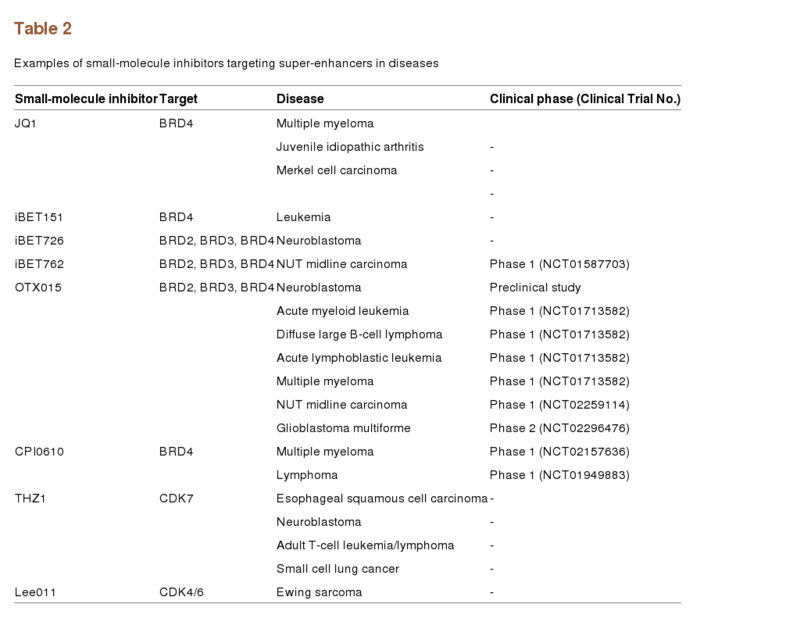 OTX015 is another BET inhibitor targeting BRD2, BRD3, and BRD4, which potently blocks the proliferation of cells both in vitro and in vivo in various hematological malignancies and solid tumors. The clinical potential of OTX015 in leukemia, lymphoma myeloma, and midline NUT carcinoma has been examined in a phase I trial (Amorim et al., 2016), and the clinical efficacy and safety profiles of OTX015 in glioblastoma were investigated in a phase II trial. The potential therapeutic efficacy of OTX015 was also evaluated in MYCN-driven neuroblastoma mouse models (Henssen et al., 2016). Discovery of small-molecule inhibitors of cyclin-dependent kinases (CDKs) has provided yet another potential approach of targeting super-enhancers associated with various diseases. Transcription of specific genes requires step-wise recruitment of key regulatory and enzymatic co-factors. In particular, super-enhancer-regulated transcription is coordinated by the recruitment of BRD4, MED1, and CDK-containing transcriptional initiation/elongation complexes (Sengupta and George, 2017). Thus, CDKs can be considered as another attractive target for treatment of super-enhancer-associated diseases. Through the cell-based screening of small-molecule inhibitors against CDKs, THZ1 was discovered as a covalent inhibitor of CDK7, which showed high sensitivity to RUNX-driven super-enhancers in T-cell ALL cell lines (Kwiatkowski et al., 2014). THZ1 was also found to preferentially block global MYCN transcriptional regulation in MYCN-amplified neuroblastoma cells (Chipumuro et al., 2014). Superenhancers-associated with proto-oncogenes of the MYC family were specifically susceptible to this CDK7 inhibitor in small cell lung carcinoma cells (Christensen et al., 2014). THZ-1 also showed selective inhibition of oncogenic super-enhancers in esophageal squamous cell carcinoma (Jiang et al., 2017) and in adult T-cell leukemia cells (Wong et al., 2017). Similarly, the CDK4/6 inhibitor LEE011 selectively inhibits CDK4, down-regulates cyclin D1-associated super-enhancers, and subsequently leads to cell death in an Ewing sarcoma xenograft model (Kennedy et al., 2015). One of the most fundamental approaches of treating genetic or epigenetic diseases is to disrupt or correct aberrant genomic sequences responsible for the generation of disease-associated super-enhancers. With the recent advances in genome engineering technologies such as TALEN and CRISPR/Cas9, it is now more convenient to generate mutations in cells or animal models, providing unprecedented opportunities to develop effective gene therapies for superenhancer-associated diseases. 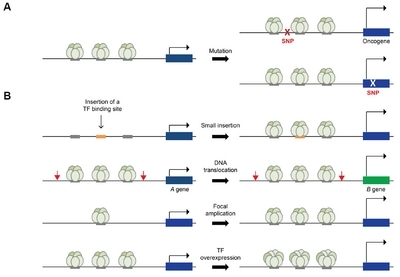 For example, to directly target the enhancer mutation site in T cell leukemia cells, the CRISPR/Cas9 genome editing technique was used to generate the deletion of mutation sites spanning approximately 200 bp. Notably, deletion of the mutant allele decommissioned the chromatin features of super-enhancers at the TAL1 locus and completely abrogated endogenous TAL1 expression (Mansour et al., 2014). TALEN and CRISPR/Cas9 genome editing systems were also applied for the genomic excision of aberrant enhancers in acute myeloid leukemia cells. Subsequent mutations were shown to reallocate the enhancer element, suppress expression of the proto-oncogene EVI1, and efficiently inhibit cell growth (Groschel et al., 2014). Although the efficacy and safety of a gene therapeutic approach targeting disease-associated super-enhancers need to be further determined in various animal disease models, these new genome editing tools truly open the door to a new era for gene therapy development. The integration of molecular biology tools with next-generation sequencing technology now provides a new opportunity to map the genomic landscape in greater detail. The recent discovery of unprecedented genome-wide enhancer subsets and identification of their unique functions in both normal development and disease progression is now a hotspot of clinical and basic research. Despite the compelling evidence of super-enhancer functions in regulating cellular identity genes, there has been scant genetic proof as to whether super-enhancers alone are sufficient to change specific cell types and determine the cell fate. Confirmation of the ability of super-enhancers to regenerate different cell types would further provide a new approach for regenerative medicine. Moreover, super-enhancers can be used as prognostic markers for the prediction of disease risk and progression. Thus, integrative analysis of a gene transcription signature and super-enhancer profile of patients or healthy individuals could emerge as an important approach for disease diagnosis. Despite massive efforts to discover small-molecule inhibitors of super-enhancers, genome editing of aberrant super-enhancers would be the most fundamental approach to cure diseases. Although it has been only four years since the CRISPR/Cas9 system was first applied to genome editing, there has been an extensive explosion in efforts to use this powerful genome editing technique for potential gene therapy. Although safety issues, including off-target effects, remain to be solved for clinical use, more advanced CRISPR/Cas9 genome engineering tools are continuously emerging, which is bringing forth a new era of gene therapy. Coupling of genome-wide super-enhancer screening with specific genome editing is expected to strengthen and establish personalized medicine in the near future. Mol. Cells.Jun 30, 2018; 41(6): 506-514. Received November 19, 2017; Accepted April 12, 2018. Achour, M., Le Gras, S., Keime, C., Parmentier, F., Lejeune, F.X., Boutillier, A.L., Neri, C., Davidson, I., and Merienne, K. (2015). Neuronal identity genes regulated by super-enhancers are preferentially down-regulated in the striatum of Huntington’s disease mice. Hum Mol Genet. 24, 3481-3496. Amorim, S., Stathis, A., Gleeson, M., Iyengar, S., Magarotto, V., Leleu, X., Morschhauser, F., Karlin, L., Broussais, F., and Rezai, K. (2016). Bromodomain inhibitor OTX015 in patients with lymphoma or multiple myeloma: a dose-escalation, open-label, pharmacokinetic, phase 1 study. Lancet Haematol. 3, e196-204. Banerji, J., Rusconi, S., and Schaffner, W. (1981). Expression of a beta-globin gene is enhanced by remote SV40 DNA sequences. Cell. 27, 299-308. Banerji, J., Olson, L., and Schaffner, W. (1983). A lymphocyte-specific cellular enhancer is located downstream of the joining region in immunoglobulin heavy chain genes. Cell. 33, 729-740. Carter, D., Chakalova, L., Osborne, C.S., Dai, Y.F., and Fraser, P. (2002). Long-range chromatin regulatory interactions in vivo. Nat Genet. 32, 623-626. Cavalli, G., Hayashi, M., Jin, Y., Yorgov, D., Santorico, S.A., Holcomb, C., Rastrou, M., Erlich, H., Tengesdal, I.W., and Dagna, L. (2016). MHC class II super-enhancer increases surface expression of HLA-DR and HLA-DQ and affects cytokine production in autoimmune vitiligo. Proc Natl Acad Sci USA. 113, 1363-1368. Chipumuro, E., Marco, E., Christensen, C.L., Kwiatkowski, N., Zhang, T., Hatheway, C.M., Abraham, B.J., Sharma, B., Yeung, C., and Altabef, A. (2014). CDK7 inhibition suppresses super-enhancer-linked oncogenic transcription in MYCN-driven cancer. Cell. 159, 1126-1139. Dowen, J.M., Fan, Z.P., Hnisz, D., Ren, G., Abraham, B.J., Zhang, L.N., Weintraub, A.S., Schujiers, J., Lee, T.I., and Zhao, K. (2014). Control of cell identity genes occurs in insulated neighborhoods in mammalian chromosomes. Cell. 159, 374-387. Drier, Y., Cotton, M.J., Williamson, K.E., Gillespie, S.M., Ryan, R.J., Kluk, M.J., Carey, C.D., Rodig, S.J., Sholl, L.M., and Afrogheh, A.H. (2016). An oncogenic MYB feedback loop drives alternate cell fates in adenoid cystic carcinoma. Nat Genet. 48, 265-272. Groschel, S., Sanders, M.A., Hoogenboezem, R., de Wit, E., Bouwman, B.A.M., Erpelinck, C., van der Velden, V.H.J., Havermans, M., Avellino, R., and van Lom, K. (2014). A single oncogenic enhancer rearrangement causes concomitant EVI1 and GATA2 deregulation in leukemia. Cell. 157, 369-381. Hay, D., Hughes, J.R., Babbs, C., Davies, J.O.J., Graham, B.J., Hanssen, L., Kassouf, M.T., Marieke Oudelaar, A.M., Sharpe, J.A., and Suciu, M.C. (2016). Genetic dissection of the alpha-globin super-enhancer in vivo. Nat Genet. 48, 895-903. Heinz, S., Romanoski, C.E., Benner, C., and Glass, C.K. (2015). The selection and function of cell type-specific enhancers. Nat Rev Mol Cell Biol. 16, 144-154. Henssen, A., Althoff, K., Odersky, A., Beckers, A., Koche, R., Speleman, F., Schafers, S., Bell, E., Nortmeyer, M., and Westermann, F. (2016). Targeting MYCN-driven transcription by BET-bromodomain inhibition. Clin Cancer Res. 22, 2470-2481. Herz, H.M., Hu, D., and Shilatifard, A. (2014). Enhancer malfunction in cancer. Mol Cell. 53, 859-866. Hnisz, D., Abraham, B.J., Lee, T.I., Lau, A., Saint-Andre, V., Sigova, A.A., Hoke, H.A., and Young, R.A. (2013). Super-enhancers in the control of cell identity and disease. Cell. 155, 934-947. Jiang, Y.Y., Lin, D.C., Mayakonda, A., Hazawa, M., Ding, L.W., Chien, W.W., Xu, L., Chen, Y., Xiao, J.F., and Senapedis, W. (2017). Targeting super-enhancer-associated oncogenes in oesophageal squamous cell carcinoma. Gut. 66, 1358-1368. Jiao, W., Chen, Y., Song, H., Li, D., Mei, H., Yang, F., Fang, E., Wang, X., Huang, K., and Zheng, L. (2018). HPSE enhancer RNA promotes cancer progression through driving chromatin looping and regulating hnRNPU/p300/EGR1/HPSE axis. Oncogene. , . Kagey, M.H., Newman, J.J., Bilodeau, S., Zhan, Y., Orlando, D.A., van Berkum, N.L., Ebmeier, C.C., Goossens, J., Rahl, P.B., and Levine, S.S. (2010). Mediator and cohesin connect gene expression and chromatin architecture. Nature. 467, 430-435. Katerndahl, C.D.S., Heltemes-Harris, L.M., Willette, M.J.L., Henzler, C.M., Frietze, S., Yang, R., Schjerven, H., Silverstein, K.A.T., Ramsey, L.B., and Hubbard, G. (2017). Antagonism of B cell enhancer networks by STAT5 drives leukemia and poor patient survival. Nat Immunol. 18, 694-704. Kennedy, A.L., Vallurupalli, M., Chen, L., Crompton, B., Cowley, G., Vazquez, F., Weir, B.A., Tsherniak, A., Parasuraman, S., and Kim, S. (2015). Functional, chemical genomic, and super-enhancer screening identify sensitivity to cyclin D1/CDK4 pathway inhibition in Ewing sarcoma. Oncotarget. 6, 30178-30193. Kulaeva, O.I., Nizovtseva, E.V., Polikanov, Y.S., Ulianov, S.V., and Studitsky, V.M. (2012). 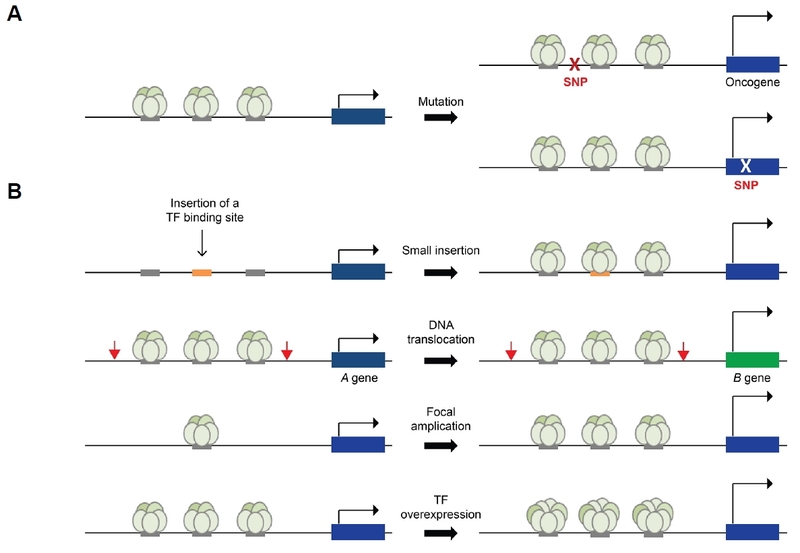 Distant activation of transcription: mechanisms of enhancer action. Mol Cell Biol. 32, 4892-4897. Kwiatkowski, N., Zhang, T., Rahl, P.B., Abraham, B.J., Reddy, J., Ficarro, S.B., Dastur, A., Amzallag, A., Ramaswamy, S., and Tesar, B. (2014). Targeting transcription regulation in cancer with a covalent CDK7 inhibitor. Nature. 511, 616-620. Le Gras, S., Keime, C., Anthony, A., Lotz, C., De Longprez, L., Brouillet, E., Cassel, J.C., Boutillier, A.L., and Merienne, K. (2017). Altered enhancer transcription underlies Huntington’s disease striatal transcriptional signature. Sci Rep. 7, 42875. Lee, H.K., Willi, M., Wang, C., Yang, C.M., Smith, H.E., Liu, C., and Hennighausen, L. (2017). Functional assessment of CTCF sites at cytokine-sensing mammary enhancers using CRISPR/Cas9 gene editing in mice. Nucleic Acids Res. 45, 4606-4618. Levine, M. (2010). Transcriptional enhancers in animal development and evolution. Curr Biol. 20, R754-763. Levine, M., Cattoglio, C., and Tjian, R. (2014). Looping back to leap forward: transcription enters a new era. Cell. 157, 13-25. Li, Y., Rivera, C.M., Ishii, H., Jin, F., Selvaraj, S., Lee, A.Y., Dixon, J.R., and Ren, B. (2014). CRISPR reveals a distal super-enhancer required for Sox2 expression in mouse embryonic stem cells. PLoS One. 9, e114485. Northcott, P.A., Lee, C., Zichner, T., Stutz, A.M., Erkek, S., Kawauchi, D., Shih, D.J., Hovestadt, V., Zapatka, M., and Sturm, D. (2014). Enhancer hijacking activates GFI1 family oncogenes in medulloblastoma. Nature. 511, 428-434. Oldridge, D.A., Wood, A.C., Weichert-Leahey, N., Crimmins, I., Sussman, R., Winter, C., McDaniel, L.D., Diamond, M., Hart, L.S., and Zhu, S. (2015). Genetic predisposition to neuroblastoma mediated by a LMO1 super-enhancer polymorphism. Nature. 528, 418-421. Ong, C.T., and Corces, V.G. (2011). Enhancer function: new insights into the regulation of tissue-specific gene expression. Nat Rev Genet. 12, 283-293. Ong, C.T., and Corces, V.G. (2012). Enhancers: emerging roles in cell fate specification. EMBO Rep. 13, 423-430. Parker, S.C., Stitzel, M.L., Taylor, D.L., Orozco, J.M., Erdos, M.R., Akiyama, J.A., van Bueren, K.L., Chines, P.S., Narisu, N., and Program, N.C.S. (2013). Chromatin stretch enhancer states drive cell-specific gene regulation and harbor human disease risk variants. Proc Natl Acad Sci USA. 110, 17921-17926. Peeters, J.G., Vervoort, S.J., Tan, S.C., Mijnheer, G., de Roock, S., Vastert, S.J., Nieuwenhuis, E.E., van Wijk, F., Prakken, B.J., and Creyghton, M.P. (2015). Inhibition of super-enhancer activity in autoinflammatory site-derived T cells reduces disease-associated gene expression. Cell Rep. 12, 1986-1996. Pelish, H.E., Liau, B.B., Nitulescu, I.I., Tangpeerachaikul, A., Poss, Z.C., Da Silva, D.H., Caruso, B.T., Arefolov, A., Fadeyi, O., and Christie, A.L. (2015). Mediator kinase inhibition further activates superenhancer-associated genes in AML. Nature. 526, 273-276. Pott, S., and Lieb, J.D. (2015). What are super-enhancers?. Nat Genet. 47, 8-12. Sengupta, S., and George, R.E. (2017). Super-enhancer-driven transcriptional dependencies in cancer. Trends Cancer. 3, 269-281. Sengupta, D., Kannan, A., Kern, M., Moreno, M.A., Vural, E., Stack, B., Suen, J.Y., Tackett, A.J., and Gao, L. (2015). Disruption of BRD4 at H3K27Ac-enriched enhancer region correlates with decreased c-Myc expression in Merkel cell carcinoma. Epigenetics. 10, 460-466. Shi, J., Whyte, W.A., Zepeda-Mendoza, C.J., Milazzo, J.P., Shen, C., Roe, J.S., Minder, J.L., Mercan, F., Wang, E., and Eckersley-Maslin, M.A. (2013). Role of SWI/SNF in acute leukemia maintenance and enhancer-mediated Myc regulation. Genes Dev. 27, 2648-2662. Tolhuis, B., Palstra, R.J., Splinter, E., Grosveld, F., and de Laat, W. (2002). Looping and interaction between hypersensitive sites in the active beta-globin locus. Mol Cell. 10, 1453-1465. Vahedi, G., Kanno, Y., Furumoto, Y., Jiang, K., Parker, S.C., Erdos, M.R., Davis, S.R., Roychoudhuri, R., Restifo, N.P., and Gadina, M. (2015). Super-enhancers delineate disease-associated regulatory nodes in T cells. Nature. 520, 558-562. Walker, B.A., Wardell, C.P., Brioli, A., Boyle, E., Kaiser, M.F., Begum, D.B., Dahir, N.B., Johnson, D.C., Ross, F.M., and Davies, F.E. (2014). Translocations at 8q24 juxtapose MYC with genes that harbor superenhancers resulting in overexpression and poor prognosis in myeloma patients. Blood Cancer J. 4, e191. Willi, M., Yoo, K.H., Reinisch, F., Kuhns, T.M., Lee, H.K., Wang, C., and Hennighausen, L. (2017). Facultative CTCF sites moderate mammary super-enhancer activity and regulate juxtaposed gene in non-mammary cells. Nat Commun. 8, 16069. Wong, R.W.J., Ngoc, P.C.T., Leong, W.Z., Yam, A.W.Y., Zhang, T., Asamitsu, K., Iida, S., Okamoto, T., Ueda, R., and Gray, N.S. (2017). Enhancer profiling identifies critical cancer genes and characterizes cell identity in adult T-cell leukemia. Blood. 130, 2326-2338. Wyce, A., Ganji, G., Smitheman, K.N., Chung, C.W., Korenchuk, S., Bai, Y., Barbash, O., Le, B., Craggs, P.D., and McCabe, M.T. (2013). BET inhibition silences expression of MYCN and BCL2 and induces cytotoxicity in neuroblastoma tumor models. PLoS One. 8, e72967. Yin, J.W., and Wang, G. (2014). The Mediator complex: a master coordinator of transcription and cell lineage development. Development. 141, 977-987. Zeng, L., and Zhou, M.M. (2002). Bromodomain: an acetyl-lysine binding domain. FEBS Lett. 513, 124-128. Zhang, X., Choi, P.S., Francis, J.M., Imielinski, M., Watanabe, H., Cherniack, A.D., and Meyerson, M. (2016). Identification of focally amplified lineage-specific super-enhancers in human epithelial cancers. Nat Genet. 48, 176-182.